Each year, 350,000 people die from sudden cardiac arrest (heart stops beating) in the United States. Most sudden cardiac arrests are caused by a disturbance in the heart's electrical system, causing a non-productive heart rhythm, which causes the heart to stop beating. The AED (Automated External Defibrillator), is a medical device that delivers an electric shock to the heart. This is done to interrupt non-productive heart rhythms and cause the heart to resume beating. According to the American Heart Association, the most important step in saving the life of a cardiac arrest patient is early defibrillation. Early defibrillation is even more important, and more effective than CPR in adults. 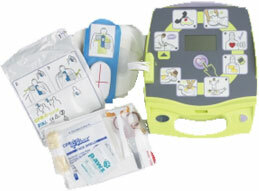 Today many companies and public places are required to have AEDs, due to their importance in saving lives. We would like to place an AED in every Hatzolah responder's emergency kit, and in many public areas, to provide for defibrillation as early as possible - thereby increasing chances of survival. Although it will be expensive to buy all these units, who can place a price on a human life? A dedication can be inscribed on the AED.